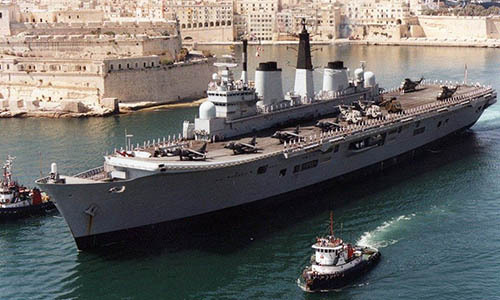 HMS Ark Royal arrives in Valletta, Malta - 8th June 1993. 14th January - Sail from Portsmouth to deploy to the Adriatic for Operation GRAPPLE. 22nd - 23rd January - Gibraltar to refuel and store ship. 27th January - Arrive in the Adriatic Sea. 25th February - Arrive in Trieste, Italy for stand-off. 1st March - Sail from Trieste. March - Visit to Piraeus, Greece. 13th April - Arrive in Naples, Italy for stand off and Self Maintenance Period. 21st April - Captain Terry Loughran joins as Commanding Officer. 22nd April - Sail from Naples. 24th - 29th May - Visit to Corfu (at anchor). 8th - 18th June - Visit to Valletta, Malta for Self Maintenance Period and station leave. 1st - 5th July - Visit to Souda Bay, Crete. 26th - 29th July - Visit to Palermo, Italy. 30th July - Handover of Operation GRAPPLE duties to HMS Invincible. 3rd August - Portsmouth for Base Assisted Maintenance Period and combined Easter and Summer Leave. September - Maintenance and leave period in Portsmouth. October - Maintenance and leave period in Portsmouth. November - Aviation trials and Air Work Up at sea. December - Portsmouth for maintenance and leave period.